Save an extra CDN$ 9.31 (34%). Buy the Kindle Edition instead. Start reading Victoria on your Kindle in under a minute. 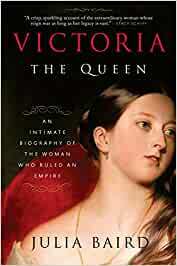 I recently purchased this book, “Victoria the Queen: An Intimate Biography of the Woman Who Ruled an Empire” by Julia Baird. The author’s writing style is thoroughly engaging and carries the reader along so that one can put it down and pick it up easily again at any time. P.S. My only “complaint” is that the KINDLE version is, presumably, formatted from the American print version. As a Canadian buying on Amazon.ca, I would have preferred the British spellings - which, I assume, would have been used by Queen Victoria herself when writing in her own diaries. Odd, to me, that a publisher/author would “correct” the Queen’s English. Creates a picture of England and the world it influenced and ruled through most of the 19th century. better still it is very readable and shows the way in which being female impacted the rule and life of this towering personage. The contradictions are superbly traced and described form a 2i century as well as from the 19th century viewpoints so this makes for a contrasting dynamic. The new research shows the relationships between Victoria and Albert, Victoria and john Brown and Victoria and Abdul in a more fulsome light. So thoroughly enjoyed every single bit of this biography! Well researched, wonderfully presented, exquisite in it's detail. I was enthralled from the moment I opened the first pages, and was very quickly absorbed by this wonderful book, generously befitting a grand woman of this magnitude and stature. A fantastic read! her husband died.......hated by her children enough to destroy her diary entries on him! Excellent, well written and covers the lives of the men other than Albert her husband that she loved until her death. Highly recommended.